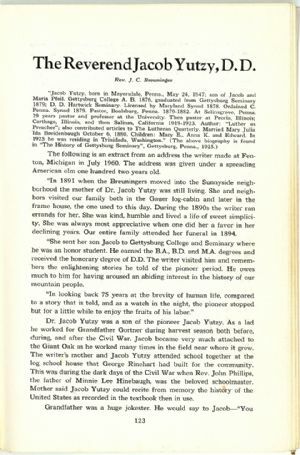 The Reverend Jacob Yutzy, D. D.
The following is an extract from an address the writer made at Fenton, Michigan in July 1960. The address was given under a spreading American elm one hundred two years old. "In 1891 when the Breuningers moved into the Sunnyside neighborhood the mother of Dr. Jacob Yutzy was still living. She and neighbors visited our family both in the Gauer log-cabin and later in the frame house, the one used to this day. During the 1890s the writer ran errands for her. She was kind, humble and lived a life of sweet simplicity. She was always most appreciative when one did her a favor in her declining years. Our entire family attended her funeral in 1894. "She sent her son Jacob to Gettysburg College and Seminary where he was an honor student. He earned the B.A., B.D. and M.A. degrees and received the honorary degree of D.D. The writer visited him and remembers the enlightening stories he told of the pioneer period. He owes much to him for having aroused an abiding interest in the history of our mountain people. "In looking back 75 years at the brevity of human life, compared to a story that is told, and as a watch in the night, the pioneer stopped but for a little while to enjoy the fruits of his labor." Dr. Jacob Yutzy was a son of the pioneer Jacob Yutzy. As a lad he worked for Grandfather Gortner during harvest season both before, during, and after the Civil War. Jacob became very much attached to the Giant Oak as he worked many times in the field near where it grew. The writer's mother and Jacob Yutzy attended school together at the log school house that George Rinehart had built for the community. This was during the dark days of the Civil War when Rev. John Phillips, the father of Minnie Lee Hinebaugh, was the beloved schoolmaster. Mother said Jacob Yutzy could recite from memory the history of the United States as recorded in the textbook then in use.